I’m going to be making desserts for my family dinners this year, and because there are going to be a pretty even mixture of adults and children, I thought it would be fun to make one “fun” recipe and another more “serious” dish. So I’m making my apple pie and I’m also making cake batter cookies and rice krispies treats! Now with the amount of sugar and marshmallows in the two recipes, they may not be considered the healthiest treats around. However, I think we should all do what we can to make little changes, so in the following two recipes I am going to substitute I Can’t Believe It’s Not Butter (< MY FAVORITE) for regular ol’ butter. I also use Country Crock when I cook at home, but I just happened to use I Can’t Believe It’s Not Butter for these two desserts. 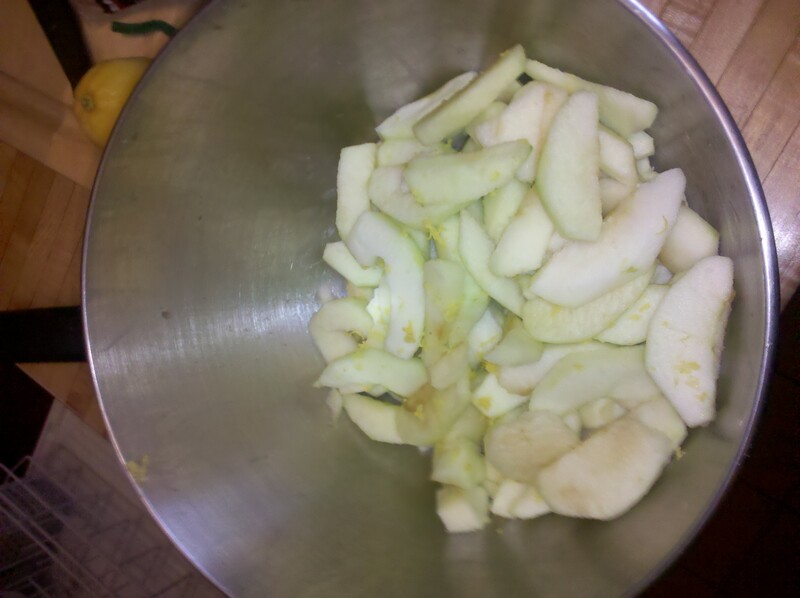 8 or 9 Granny Smith Apples (this time I added about 4 or 5 red apples too! I Can’t Believe It’s Not Butter: 2-4 Tablespoons. So basically, you will peel and cut your apples. Next you can grate your lemon peel and juice it over the apples. Mix together the flour, sugar, cinnamon, nutmeg and about 1 tablespoon of butter. After you’ve got that all mixed up, you can literally toss it in your crust and cover with the second layer of dough. Next, you’ll beat the egg and brush it completely over the dough. After that, I sprinkled some brown sugar and sugar on the top. 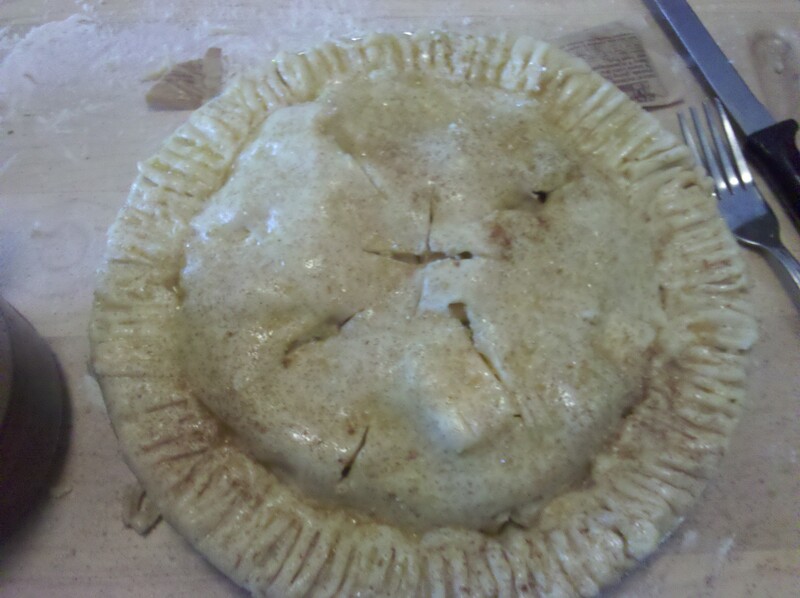 Then I cut a little design in the top before I baked the pie. The MOST important part is that you stick some I Can’t Believe It’s Not Butter under the cuts you just made. I honestly don’t remember why, but my mom told me this years ago, so I’ll listen to her. Tada! All done. (Well, that technically isn’t true, before you stick it in the oven, you’re going to want to heat it to 400 degrees. Then cook for about 45 minute. You’ll tell its done when the crust is golden brown and the juices are bubbly. This one is easy. First, melt the I Can’t Believe It’s Not Butter and the marshmallows in a huge pan. 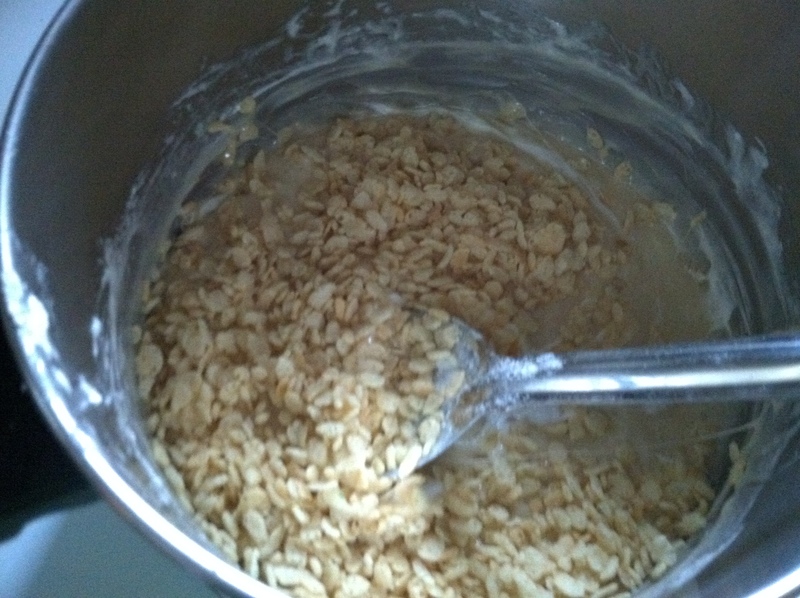 Once they are lumpy and mostly melted pour in the rice krispies cereal, but you must do this part slowly. It’s tough to mix this around, so if you put too much cereal in at once, it’s going to be even harder to mix. 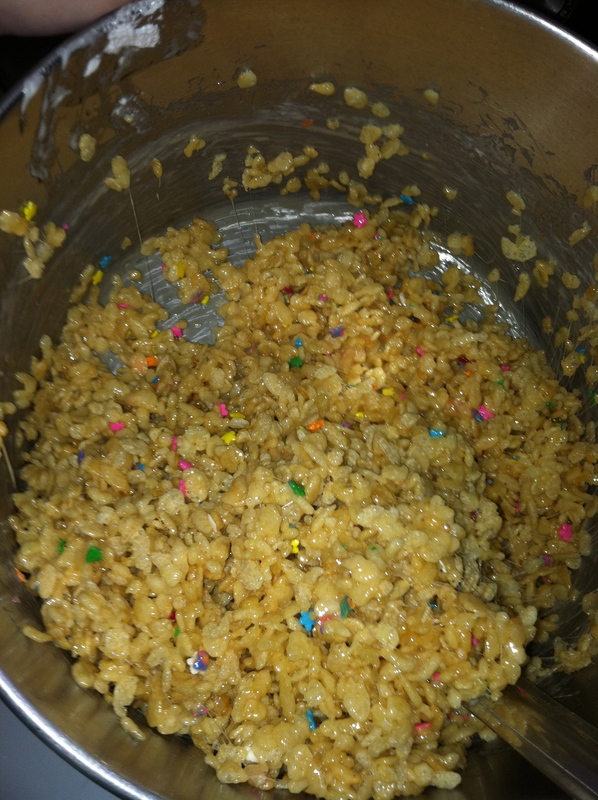 When you’re getting pretty well mixed, I’d toss in a handful of sprinkles. 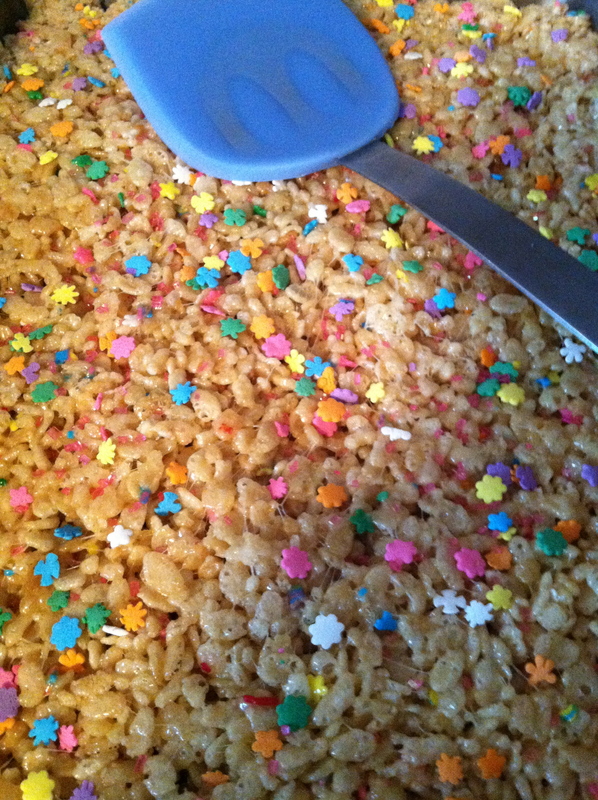 Then you spread the coated rice krispies into a pan and you’ll want to put a bit more sprinkles on the top. THAT IS IT, FOLKS! Simple! I haven’t decided if I am going to frost these or not. Maybe I’ll just glaze them with white chocolate. Yum. 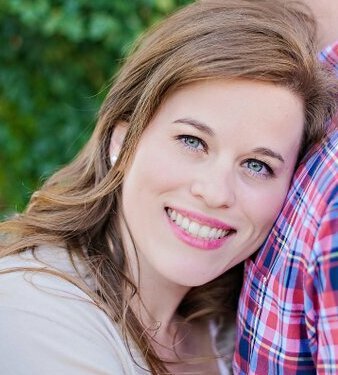 I don’t want to sound like a broken record, but I honestly love Country Crock and I Can’t Believe It’s Not Butter. One of those two brands are always in my fridge, and I use them to cook all the time. Whether its simple as toast or mashed potatoes, or I’m cooking desserts for Thanksgiving…I’m a I Can’t Believe It’s Not Butter FAN! This entry was posted in Cooking, Holidays.